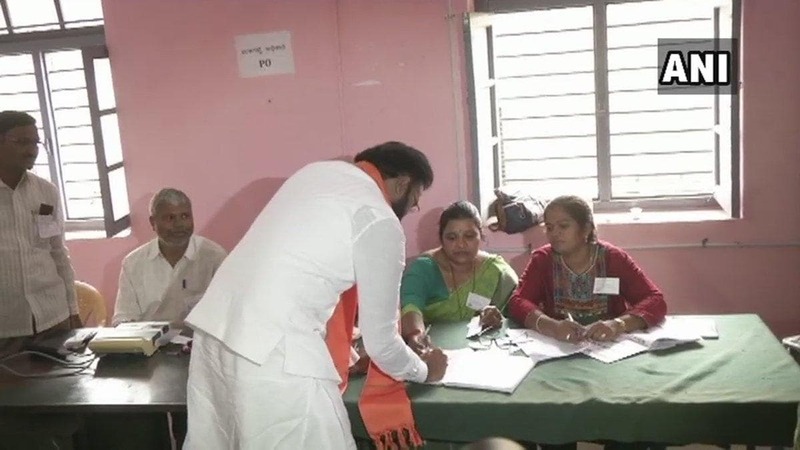 About 35 per cent voting was recorded on Saturday during the first half of polling for the by-polls to three Lok Sabha and two assembly constituencies in Karnataka. While the Lok Sabha constituencies of Shivamogga, Ballari and Mandya have recorded 30.20, 35.72, 26.80 per cent voting, respectively, till 1 pm, the assembly segments of Ramanagara and Jamkhandi reported 39.81 and 43.50 per cent respectively. Voting began at 7 am, will go on till six in the evening. A total of 54,54,275 voters are eligible to exercise their franchise in about 6,450 polling stations. There are 31 candidates in the fray in the five constituencies, though the contest is mainly between the Congress-JD(S) combine and the BJP. Counting of votes will be held on November 6. Though the turnout was low during the initial few hours after polling began, it improved as the day progressed, officials said. Barring reports about the delay in voting due to technical issues at a couple of places, polling in all the five constituencies have been by and large peaceful so far, the officials said. The by-elections are being seen as a litmus test for the ruling Congress-JD(S) coalition as its outcome is expected to have a bearing on the state's political scenario. The Congress and the JD(S), who came together in a post-poll alliance after the assembly elections in May threw up a hung House, have decided to face the polls unitedly against the BJP, which they perceive as their common rival. While the Congress has fielded its candidates in Jamkhandi and Ballari, JD(S) is contesting in Shivamogga, Ramanagara and Mandya under an electoral understanding. Among the prominent candidates in the fray is Chief Minister H D Kumaraswamy's wife Anita Kumaraswamy, who is expected to have a smooth sail as she is facing virtually no-contest in Ramanagara after BJP nominee L Chandrashekhar withdrew from the contest and rejoined the Congress, in a jolt days before the polls. The BJP had lodged a complaint with the Election Commission about the development in Ramanagara and requested it to "annul" the elections immediately. In Jamkhandi, Congress candidate Anand Nyamagowda, son of former MLA Siddu Nyamagouda, is pitted against Srikant Kulkarni of the BJP. State BJP chief B S Yeddyurappa's son BY Raghavendra is testing his fortunes in Shivamogga against another former chief minister S Bangarappa's son Madhu Bangarappa of the JD(S). Yeddyurappa and his family members were among the early birds to cast their vote at Shikaripura in the constituency. In Ballari, senior BJP leader Sriramulu's sister J Shantha is contesting against V S Ugrappa of the Congress, considered an outsider. In the Vokkaliga belt of Mandya, JD(S)'s Shivarame Gowda, is pitted against a fresh face in Dr Siddaramaiah, a retired commercial tax officer from the BJP. The by-elections have been necessitated after Yeddyurappa (Shivamogga), Sriramalu (Ballari) and C S Puttaraju of JD(S) (Mandya) resigned as MPs on their election to the assembly in May this year. Bypolls to Jamkhandi assembly seat was caused by the death of Congress MLA Siddu Nyamagouda, while Ramanagara fell vacant after Kumaraswamy gave up the seat preferring to retain Chennapatna, the other constituency from where won.